05/25/14 W49. Benton bottle-neck, 3 3/4", TN\KY, hornstone, well made with some use wear along the blade edges, much nicer than the picture, $69. 05/04/14 W50. 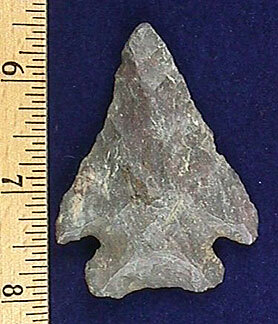 Kirk corner-notch, 2 9/16", IN, tan chert, ground base\stem\notches, use wear along cutting edges, symmetrical and a good value at $25. 10/12/13 A133. 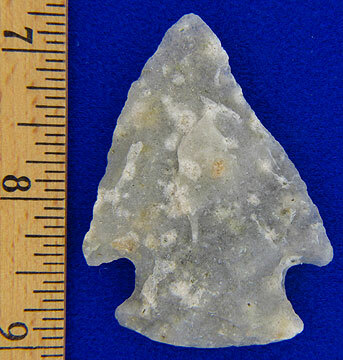 Savannah River, 4 11/16", Choctaw Co., AL, creek-stained Tallahatta quartzite, thin and well made, some use wear on the blade edges, $149. 10/12/13 A134. 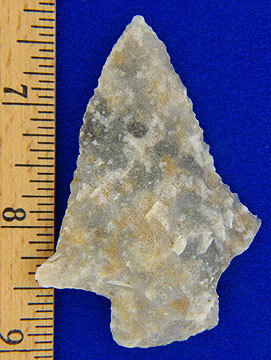 Choctaw Co., AL, Tallahatta quartzite, $89. 10/12/13 A135. 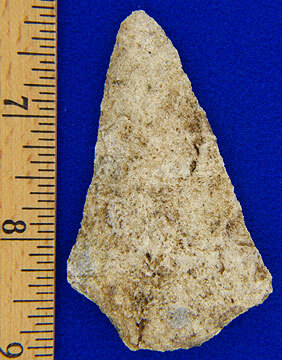 Greenbriar,2 3/4", Choctaw Co., AL, Tallahatta quartzite, nice example with beveled edges and ground base and notches, $99. 10/12/13 A136. 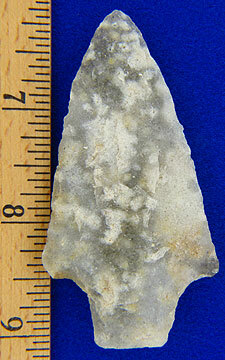 Abbey, 2 3/4", Choctaw Co., AL, Tallahatta quartzite, serrated edges with an ancient ding on the ear, $89. 10/12/13 A137. 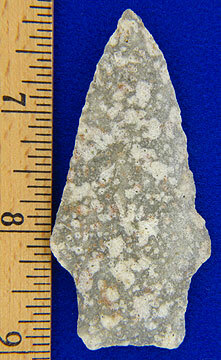 2 11/16", Choctaw Co., AL, Tallahatta quartzite, $125. 10/12/13 A138. 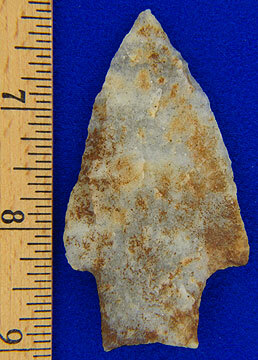 2 15/16", Choctaw Co., AL, Tallahatta quartzite, $50. 10/12/13 A139. 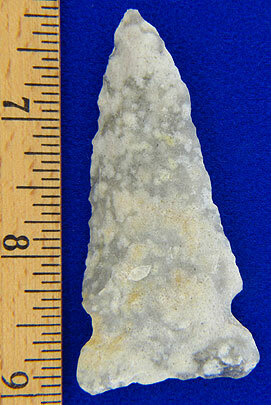 Semonole, 2 1/8", Choctaw Co., AL, Tallahatta quartzite, $99. 10/12/13 A140. 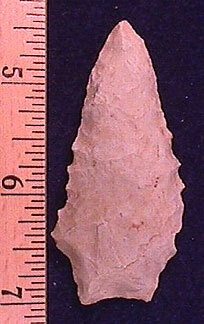 Bolen, 2 1/4", Choctaw Co., AL, Tallahatta quartzite, $99. 10/12/13 A141. 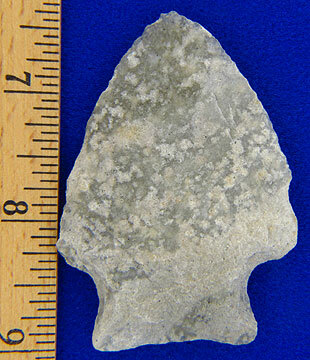 Savannah River, 2 13/16", Choctaw Co., AL, Tallahatta quartzite, $99. 10/12/13 A142. 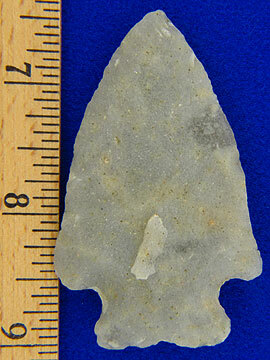 2 15/16", Choctaw Co., AL, Tallahatta quartzite, $75. 10/12/13 A143. 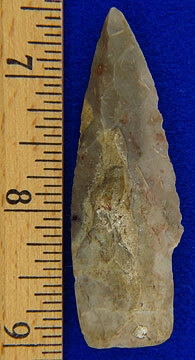 Bascom, 2 3/4", Choctaw Co., AL, Tallahatta quartzite, thin and well made, $75. 10/12/13 A144. 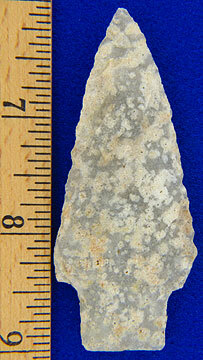 Levy, 2 13/16", Choctaw Co., AL, creek-stained, Tallahatta quartzite, well made with nice coloration, $75. 10/12/13 A145. 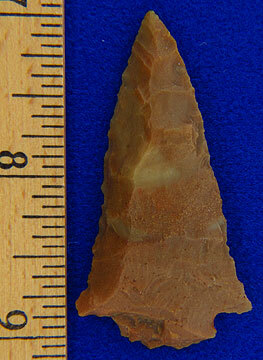 2 9/16", Choctaw Co., AL, Tallahatta quartzite, $65. 10/12/13 A146. 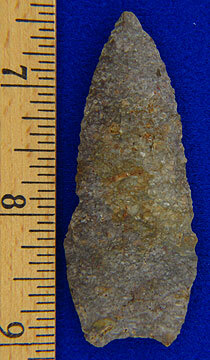 2 5/8", Choctaw Co., AL, Tallahatta quartzite, $65. 08/27/13 A148. 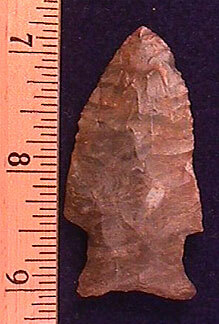 Jackie Stemmed, 2 1/8", AR, mottled tan Crowley's Ridge, ex-Ken Partain, excellent example, $60. 08/27/13 A149. 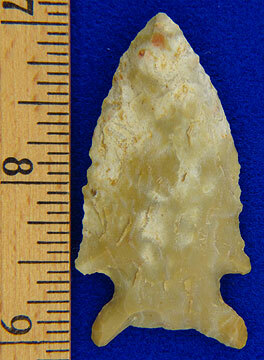 Sold Rice Lobed, 2 5/16", AR, light tan, ex-Ken Partain, thin and well made, $45. 08/27/13 A150. Angostura, 2 5/8", MO\AR, speckled tan and gray, fine edgework, you can see where the blade was resharpened while hafted, ex-Ken Partain, $59. 08/27/13 A152. 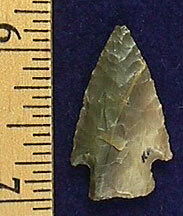 Bulverde, 2 1/2", NM, Edwards Plateau chert, ex-Ken Partain collection, $35. 08/27/13 A153. 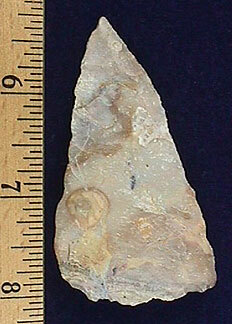 Darl Stemmed, 2 1/16", TX, Edwards Plateau chert, well made with fine edgework, much better in hand, $45. 08/27/13 A154. 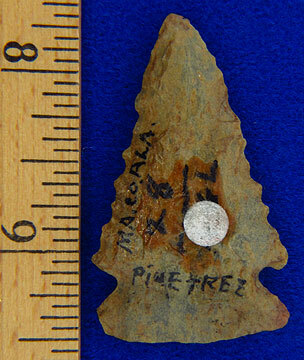 Pinetree, 1 7/8" , Macon Co., AL, mottled green and tan, well made with serrated edges, $25. 08/27/13 A155. 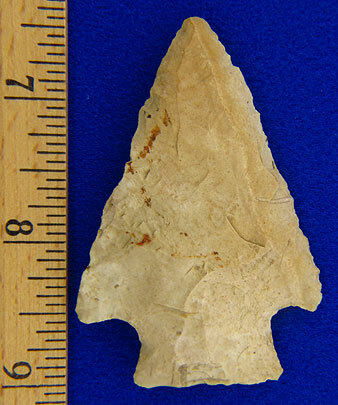 Decatur, 2 1/8", Bath Co., KY, Carter Cave, a real heartbreaker, frost or fire damage to base, excellent workmanship and worthy of restoration, $19. 07/30/11 A156. (A140) Baker, 1 3/16", NM, olive green and tan, well made with pleasing color, $20. 07/30/11 A157. 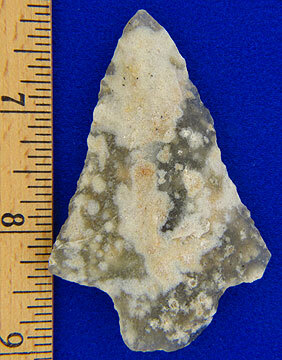 (A141) Baker, 3/4", NM, mottled brown jasper, pretty, well used example, $15. 02/02/11 A160. 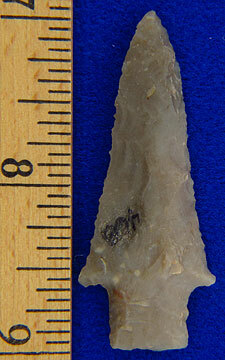 (A146) HOLD Kirk corner-notch, 2", OH, Upper Mercer chert, ex-Vietzen collection, thin and well made, $30. 02/02/11 A161. 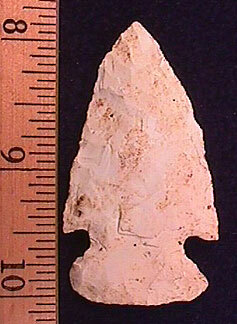 (A147) HOLD Kirk corner-notch, 2 7/16, most likely KY or OH, Ft. Payne? Nethers?, ex-Vietzen collection, very nice point with lots of use polish, $49. 02/02/11 A162. 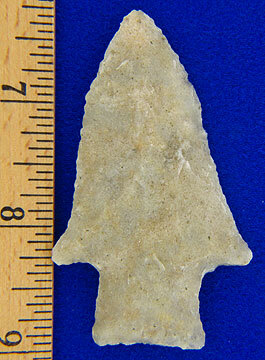 (A148) Pinetree, 2 1/16", KY, Ft. Payne, nice point with killer serrations, $25. 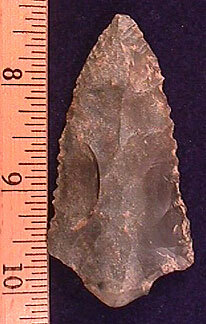 02/02/11 A163. 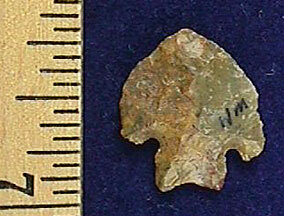 (A149) Big Creek, 2 3/16", MO, Burlington chert, ex-Ken Partain, thin and well made, $25. 02/02/11 A164. 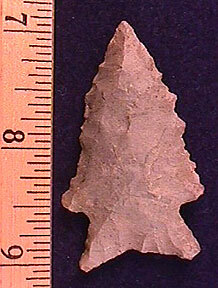 (A150) Pinetree, 2 1/4", TN, Dover chert, very fine edgework, pretty material, $39. 02/02/11 A166. 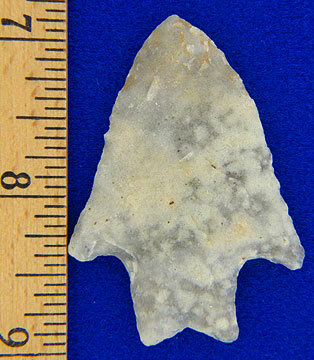 (A152) Early backed knife, 2 13/16", most likely KY or southern OH, Bolye chert, ex-Vietzen collection, pretty material with fossil inclusions, $25. 06/09/10 A168. 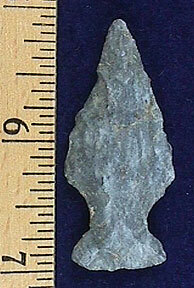 (A154) HOLD Ashtabula, 1 15/16", OH Upper Mercer chert, ex-Vietzen collection, $19. 09/04/09 A169. 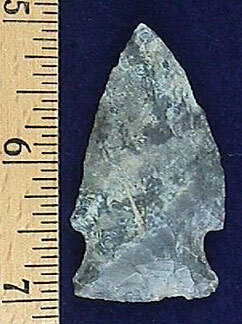 (A155) Morrow Mountain, 2 3\4", KY, Sonora like colors, killer edgework with fine serrations, $35.